GOLFTIME - The Golfers Watch! The Lady Golftime Swiss Golf Watch is an innovative precision instrument that helps the keen golfer keep score via an ingenious bi-directional bezel. Dimensionally the timepiece has a well proportioned brushed steel case that measures 42mm x 12mm. Other features include a stylish white dial (with golf ball dimples), raised gold numerals and a white leather strap. At the heart of the watch is a Swiss made quartz movement. 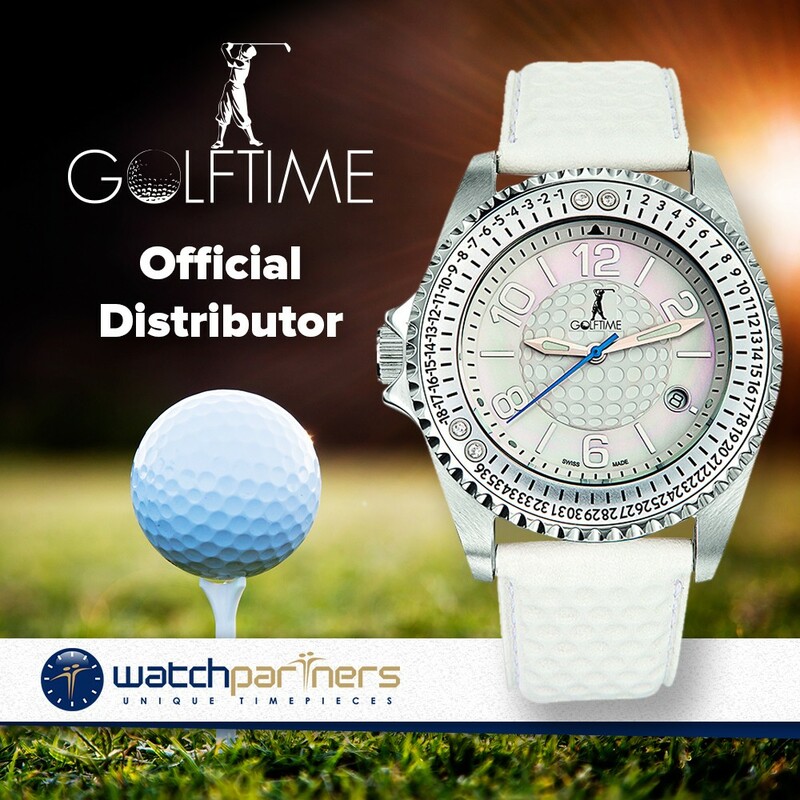 GOLFTIME was created on a green between a watchmaker and his partner. The challenge: how do we reconcile these two passions of standards and quality? The solution: Create a unique watch model dedicated exclusively to the practice of their passion. 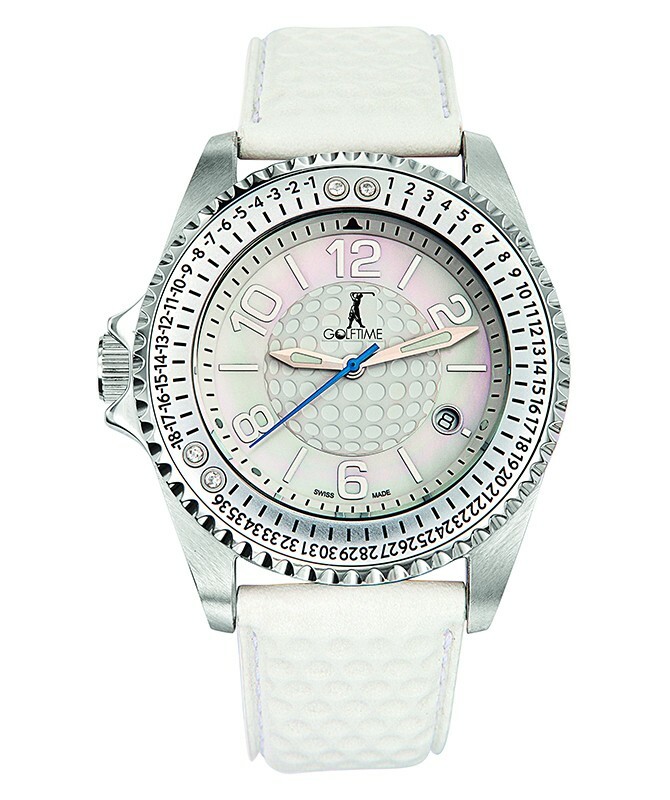 Design a watch golfers which is both functional & can be worn elegantly on the greens or elsewhere. Distinguished, exclusive, available in several versions, GOLFTIME SWISS MADE is technically flawless. Designed and developed in a factory in SWITZERLAND in the canton of Jura, GOLFTIME is designed for playing golf. The watch bears an inverted crown and bi-directional turning bezel (patented) which can be easily be used to calculate & record your golf score in real-time! Elegant and sporty, the GOLFTIME proves that those who wear it are truly passionate about standards and quality. On the greens or off, evidence of your passion! GOLFTIME FOR GOLFERS: GOLFTIME is exclusively designed for our sport. The inverted crown does not hinder your swing, and the bi-directional bezel is graduated to calculate your real-time score in strokeplay. This watch represents true Swiss quality, created in the watchmaking tradition with the demand for quality & attention to detail, has the expertise of a true enthusiast watchmaker. Engraved steel case, screw-down crown steel crown, steel screw back, water resistant to 100 meters, mineral glass, leather strap fashioned with hand-made golf ball dimples or steel bracelet. The GOLFTIME is the successful marriage of a passion and a business tradition. A real watch for real golfers!